Rich amino acids, beta carotene, fatty acids, phytochemicals and antioxidants help to improve circulation and promote the synthesis of collagen. Gotu Kola helps to soothe and minimize stretch marks (scars), eczema and psoriasis while helping with healing and firming the skin. Two patented active ingredients ( Lipout tm and IntenSlim tm)help to create a healthy, smooth body contour with their thermogenic and natural fat burning properties. We were thinking about trying this on those pesky jowls and the loose neck skin that many people get as they age. The science is there - let us know how it works for you! Intenslim tm: natural fat burner and fights against fat accumulation particularly on the stomach area. It also stimulates the synthesis of elastin which promotes adipocytes to return to their original shape. Apply to all areas of the body that you wish to promote firm, smooth skin. Apply liberally every day. How do I do a body wrap? It is so easy. You probably have everything you need in your kitchen! Plastic wrap anyone? 1-5x per week, apply cream to problem areas. Tear off a big sheet of plastic wrap, and wrap around the area. *Get a bit extra so that it will stick to itself. You can apply waist trainers or other body shape wear on top of the plastic. Leave on a minimum of 1 hour and up to overnight (8 hours approximately). *Remove if your skin has become irritated. Warmth is expected! Apply 1-2x daily on all problem areas. It's that simple. The Gotu Kola is exceptionally helpful in reducing stretch marks. Apply as needed to soothe and hydrate. Centella Asiatica is a popular herb in Ayurveda for thousands of years. The primary actives of centella asiatica are are saponins (triterpenoids). These triterpene saponins and their sapogenins are mainly responsible for the wound healing and vascular effects by inhibiting the production of collagen at the wound site. More studies are being performed and they are all positive. A preclinical study reported that various formulations of gotu kola applied to open wounds three times daily for three weeks, resulted in increased cellular proliferation and collagen synthesis at the wound site. This shows an increase in collagen content and tensile strength. It was also shown to stop the inflammatory process which can provoke hypertrophy in scars. So this is an excellent product to apply to wounds and scars that are freshly healed over. Both in vivo clinical studies and human monolayer cell culture experiments have concluded that asiatic acid influences collagen synthesis. You will find this body cream to be antiaging, healing and nurturing to your skin. *Lipout tm (PRovital Group): Thermogenesis is the process by which an organism produces thermal energy or heat. White adipocyte = fat storage. Brown adipocyte = thermogenic burning. Lipout induces the browning of white adipocytes. Thermogenesis was confirmed by an increase in the skin temperature of volunteers following application. In other words "burn fat - burn". 61 volunteers, men and women, between 18 and 60 years of age, all with a body mass index (BMI) of above 23 for the women and above 25 for the men. A cream-gel with 3% Lipout™ was compared with the same formulation without active ingredient (placebo). 21 women and 10 men applied the placebo and 20 women and 10 men applied the formulation with Lipout™ twice a day for 2 months. Women applied the product on their abdomen, hips and thighs in order to evaluate fat and cellulite reduction. Men applied the product on their abdomen only in order to evaluate fat reduction. The volunteers did not apply any other product or treatment during the study. They were instructed not to change diet or life-style habits during the study. A flexible tape measure was used to measure the female volunteers’ hips and thighs, along with the abdomens of both men and women. Thighs: average reduction of 1.0 cm at D28 and of 1.4 cm at D56 of the treatment, with a maximum reduction of 5.7 cm. Hips: average reduction of 0.7 cm at D28 and of 1.3 cm at D56 of the treatment, with a maximum reduction of 5.5 cm. Women: average reduction of 1.4 cm at D28 and of 2.2 cm at D56 of the treatment, with a maximum reduction of 5.0 cm. Men: average reduction of 1.2 cm at D28 and of 1.7 cm at D56 of the treatment, with a maximum reduction of 10.4 cm. Lipout™ significantly reduces body circumference in both men and women by decreasing the thickness of subcutaneous adipose tissue. Skin elasticity is a measure of its ability to return to its original position after applying a negative pressure. Among various parameters obtained by the Cutometer®, is the most accurate to represent the elasticity of the skin. . There was a statistically significant improvement in skin elasticity after 28 days of applying Lipout™. This was found in both the superficial and deeper layers for all the body areas evaluated. 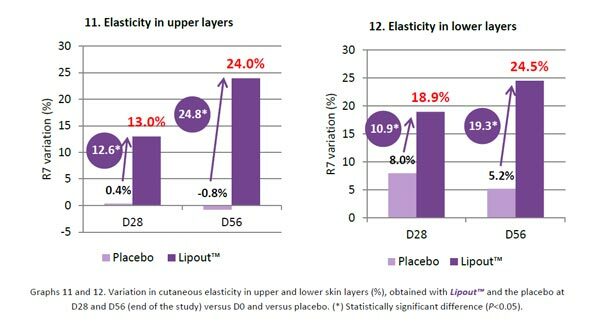 The elasticity of the upper layer of the skin increased by 12.6% and 24.8% with Lipout™ compared to the placebo. Lipout™ also increased the elasticity of the skin’s deepest layers, by 10.9% and 19.3%, with a significant difference compared to the placebo. There was a statistically significant decrease after 28 and 56 days for the skin of the group applying Lipout™, both in superficial and deeper layers. This means that the skin firmness increased significantly with Lipout™ in comparison with the placebo. Firmness increased by 16.1% in superficial layers and by 11.7% in deeper layers after a month, and by 25.5% in superficial layers and 28.9% in deeper layers after two months of Lipout™ application. Given that Lipout™ activates the essential mechanisms that promote thermogenesis in fatty tissue, an evaluation was made as to whether applying Lipout™ resulted in an increase in skin temperature, reflecting this fat-burning activity. 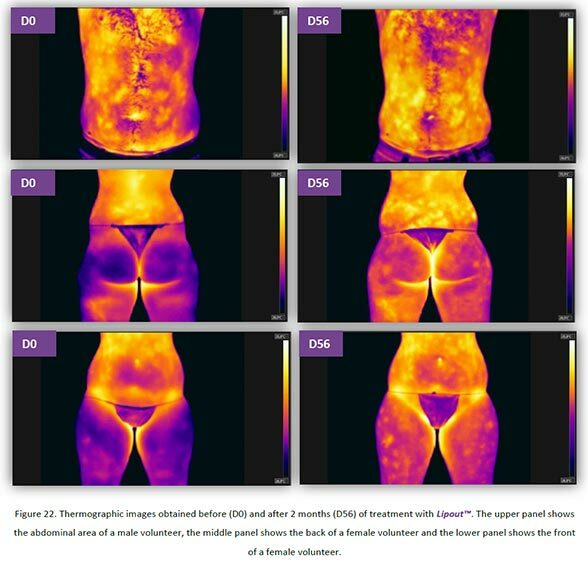 Skin temperature in the treated areas was evaluated at D0 and D56 using thermography images of the relevant body areas: the abdomen in men and women and the hips and thighs for women. *Platinum Skin Care makes no claims that you will receive results like the studies above. We are furnishing you with studies so that you may make your own judgements. Lipout™'s effect on skin temperature is clearly visible on the thermographic images (Figure 22). On the images from the beginning of the study colder areas (violet) can be seen for both men and women. These cold areas indicate the presence of thermogenically inactive tissue (lipid storage). After two months of treatment with Lipout™ the violet areas become orangey-red, indicating a significant increase in fat-burning thermogenic activity. These results confirm that Lipout™ induces thermogenesis in vivo, as well as in vitro as was previously demonstrated. For women, Lipout™ application gave a difference of 0.9ºC versus the placebo at D56. For men, Lipout™ application gave a difference of 1.3ºC versus the placebo at D56. 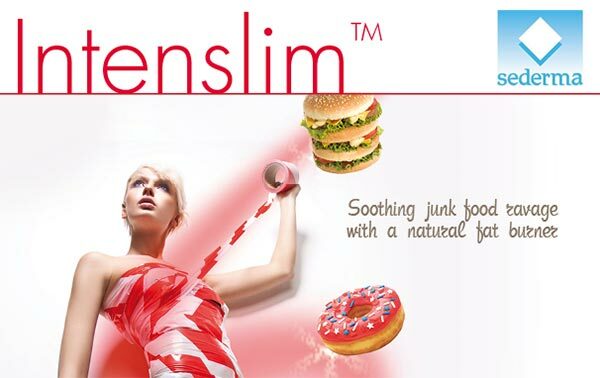 Intenslim™ by Sederma acts as a slimming agent. It is a natural fat burner and fights against fat accumulation particularly on the stomach area. Moreover, it promotes the synthesis of desnutrin, a key enzyme in lipolysis activation and soothes the inflammation reaction caused by trans-fatty acids. It stimulates the synthesis of elastin which promotes adipocytes to return to their original shape. Globularia cordifolia which stimulates hormetic defences in skin cells to detoxify them and improve skin quality. Plant caffeine also obtained by supercritical CO2. INCI Name: Butylene Glycol (and) Globularia Cordifolia Callus Culture Extract (and) Zingiber Zerumbet Extract (and) Caffeine. 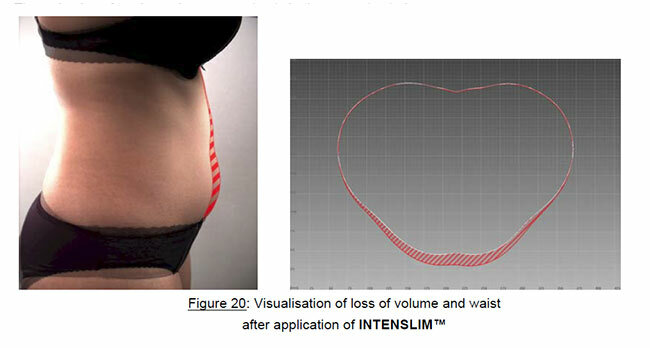 Variation of the circumference (waist) and the volume of a band of abdominal adipose tissue after application of INTENSLIM™ A very pronounced fall in waist was seen after applications of INTENSLIM™ 4% from 1 month (-0.5 cm, p<0.05), which doubled after 2 months (1 cm; p<0.01). The reduction at T2 months in 1/4 of the volunteers (6/25) was equivalent to a half dress size. Volume measurement by the equipment showed the same effect seen for circumference with falls in volume of 4% (-80 ml) and 6.7% (-128 ml) at T 1 month and T 2 months respectively. INGREDIENTS: Purified Water (aqua), Caprylic/Capric Triglycerides, C12-15 Alkyl Benzoate, Olive Squalane, Ethoxydiglycol, Cetyl Alcohol, Plankton Extract, Glycerin, Glabularia Cordifolia Callus Culture Extract, Caffeine, Zingiber Zerumbet Extract, Centella Asiatica, Camellia Sinensis Extract (Green Tea),Tocopherol Sodium Hyaluronate, Gynostemma Pentaphylum Extract, Panax Ginseng Extract, Dimethicone, Acryloyl Dimethyl Taurate Copolymer, Glyceryl Stearate, Butylene Glycol, Phenoxyethanol, Ethylhexylglycerin, Fragrance. 16oz.